Life is Good – Especially with nutritious plant based proteins! The retreat in Palm Springs, California with Robin Shirley (pictured) was awesome. Robin hosts retreats around the country for the company she founded “Take Back Your Health”. The weather was over 110 each day but that didn’t stop the 8 of us from enjoying each other’s company and learning new things about healthy living, healthy eating and food preparation. The other participants were all from the LA area but Bob and I brought the Aloha spirit. Robin prepared all the food and we were treated to delicious dishes that both nourished and inspired us to cook healthy, organic meals for our families. When I returned home, I placed all blogging on hold while I was scheduled to prepare lunch for a group of 18 Red Cross supporters which prompted me to get creative. I created six healthy salad dishes which were inspired by what I learned at the retreat. I prepared and served a lentil salad, a quinoa salad, a carrot, pineapple and raisin salad, a curry chicken salad, red bliss potato salad, and a green salad. These all met to rave reviews from a very discriminating group of ladies. Cooking for such a large group was a challenge but with the right tools and knowledge, it can be very rewarding and inspirational. Healthy cooking is not hard and all it takes is the right combination of organic ingredients and good step-by-step recipes to follow. In my future blogs, I will continue to share with you how to make healthy and nutritious dishes that you and your family will love. Today I want to share with you information about beans and lentils as well as a delicious recipe for Lentil Salad. Lentils are naturally gluten free. A one cup serving of the salad provides 17 grams of protein. Lentils have folate and fiber! Cilantro helps to pulls heavy metals (including mercury) out of your body. Parsley helps to cleanse the bladder. Red onion contains quercetin, which acts as an antioxidant and can slow the growth of some cancer cells. Beans and lentils are packed with tons of fiber, as well as plenty of iron and protein. They are rich in antioxidants and phytonutrients. They are low in calories. Beans and lentils are both legumes and some of the most powerful, nutrient-dense plant foods around. According to Dan Buettner of Blue Zones, eating a cup of beans a day will add up to 4 years to your life. Plus, studies have found beans to lower risk of cancer, cardiovascular disease, and diabetes. Blend cooked beans with tomatoes, onions, and your favorite seasonings to create a yummy bean soup. Puree beans with a bit of olive oil, a garlic clove, salt, and your favorite seasonings. Voila! A fast dip or sandwich spread. 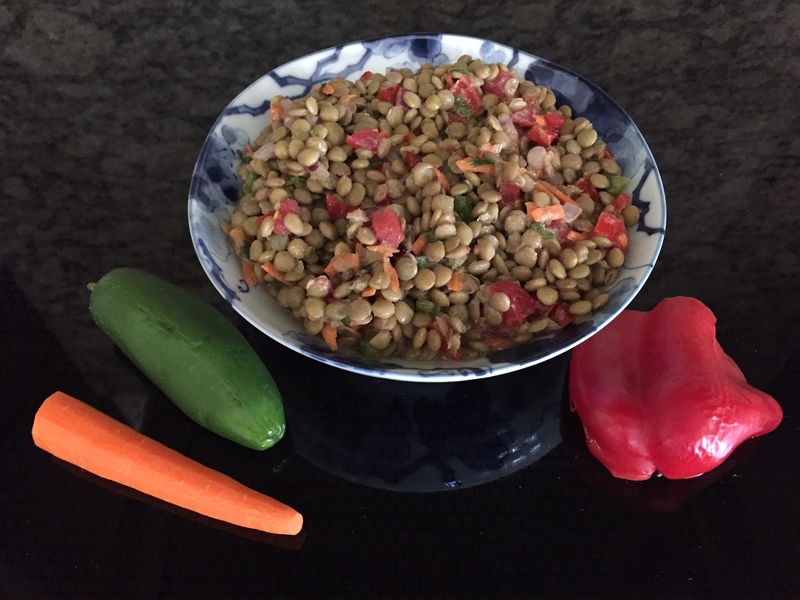 The picture below will take you to the lentil salad recipe I promised! Enjoy in good health! Would you like help learning how to choose and cook healthy foods like beans? Curious about how health coaching can help you make your own healthy changes? Let’s talk! Schedule an initial complimentary consultation with me today—or pass this offer on to someone you care about! I received my training from the Institute for Integrative Nutrition, where I learned about more than one hundred dietary theories and studied a variety of practical lifestyle coaching methods. Drawing on this knowledge, I will help you create a completely personalized “roadmap to health” that suits your unique body, lifestyle, preferences, and goals. Contact Me.